An American woman and fellow cruiser we are acquainted with was accused of stealing a local's iPad in Bequia. The woman's husband was on heavy pain medication for a back injury and lost in la-la-land.....code for - he was out of it. Tom and cruiser George sprung to action to assist as things were going downhill fast. We are thinking....."This has to be a mistake." By the time the guys get her husband and get ashore, she has already been booked in Bequia and is being loaded, "handcuffed" onto the ferry to the mainland of St Vincent for formal charges. She will either go directly to court if court is in session, or to the central jail for holding until court is in session. Either way, not good. The next ferry isn't until 13:00. A local advises...."Don't wait for the next ferry. You really NEED to be there ASAP. Do you understand what I am saying to you?" Things are really happening fast! We are still thinking......."But this has to be a mistake or misunderstanding." A cruising friend asks "But how well do you really know her?" Hum? A mad scramble ensues. The guys secure a private go fast boat to take them and hubby across to St Vincent. A local recognizes trouble and steps up with the name and number of a good lawyer in St Vincent. I begin emailing a few select people who may have contacts and connections. The US Embassy has been moved to Barbados but I get a name and discover this person may be on island if I can track him down. The seriousness of this sinks in, an American woman is handcuffed in St Vincent awaiting trial and possibly jail. The guys come back to the boats and grab wads of EC and US dollars, cell phones, ID's /passports, and rain jackets - this is an open boat they will be crossing in. Hubby sits stunned in a pain med induced haze. Tom and George are directing everything. We are thinking....."Maybe this is just a big mistake, or a set up? Things are happening SO fast?" Hum? 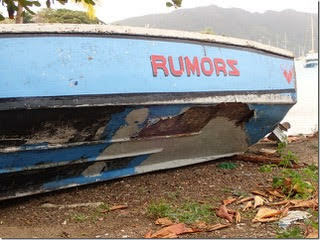 The guys take off for St Vincent in "Rumors" a 16ft wooden, open boat with 75 hp outboard. It is approximately 10 nautical miles across to St Vincent. The channel is usually windy, choppy and wet and it was. They pound across. 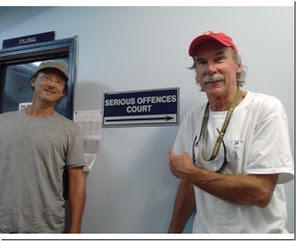 The boat driver Shawn not only gets them there but escorts them to the lawyers office. "You will never find it on your own." What a guy! The lawyer sees them immediately. After 5 mins of hearing the story as they know it, he asked "Where is she now?" The guys respond "We don't know. The Bequia Police said she would either be in jail awaiting trial or in court if it is in session." He makes a couple of calls. "She is in court. Come on. We must go now." It is late morning. Tom texts me updates. I am over on George's boat with his wife Jan still working on embassy and department of state contacts we may need. Jan asked "So, how well do you really know her?" I don't even know her or his last name without looking at their boat card. But that is true for most cruisers I "know." Rumors in for serious repairs after the crossing with the guys - OMG! The guys walk with the lawyer through the back alleys and side streets of Kingstown (no place a cruisers should ever be) to the courthouse. The Serious Offenses Court - no place a cruisers should ever be....inside or out. The woman is already in there awaiting trial. Lawyer and hubby go in. Tom, George and Shawn wait outside. After an hour, they all come out. She has plead guilty, been sentenced and paid a fine. They all go to eat a late lunch. We get word they are headed back. Half way back a fierce squall hits, more wind, waves and rain. Then Shawn's outboard starts acting up. Typical island boat - no VHF, no lights, just the basics. He did have life jackets however. A fuel tank pickup was the issue. The outboard would go and then not, then go and then not. They crawled back in fits and starts. Jan and I were thinking "So she did it? Maybe they got confused at the cafe and each picked up an iPad not knowing. Maybe that was it?" The few people I had reached out to for possible connections for help were emailing back "So it's possible she did it?" Hum? Shawn dropped everyone off at their boats. I went back to sv Honey Ryder. We each had a stiff drink on our individual boats. Tom said "She did it. She admitted she took it. So how well do we really know them? I mean we really don't know them other than the few times we have been in group settings with them." Then began the long, drawn out process of analyzing every single aspect of this......episode, over and over, and over again. I will spare you that. It is worth noting that there was video proof of the theft. The local, Andy, whose iPad was stolen was sick of theft and everyone blaming the locals, so he put in a video camera. He is a local community leader, running the youth sailing program among other community charities, events and such. The island is small. Word travels fast. Everyone knew what happened. Everyone knew George and Tom were involved. Guilt by association? We wondered. They asked them in the following days "What happen with the white woman who stole the iPad? She get off? She didn't go to jail did she?" That is when we learned that standard sentencing for this type of crime is two months jail time. Think about that! TWO months in a foreign jail. Some cruisers have commented "That seems harsh." Really? Would they think it was harsh if it was their iPad that got stolen. I doubt it. She plead guilty with the lawyers help! Paid a fine of $400 EC or appox $150US and NO jail time. No deportation. Lawyer fee was $600US. This brings up the whole locals vs cruisers. In the days following there seemed to be an under current of them vs us. Andy was right. More often than not, when things go missing/stolen, the blame is immediately assigned to "locals" stealing. Tom and I have come to believe that much of the theft that happens to cruisers is in fact committed by cruisers but blamed on locals. Solar panels, battery chargers, generators, sailing gear, etc....this is cruiser on cruiser theft. Dinghy accessories - cruisers. Dinghy outboards - this one is split. It is probably more locals but I personally think some of it is cruisers. It was literally announced last spring and again this year on the Martinique morning net "Boats are headed back across the Atlantic to Europe. Lock everything up unless you want to lose it as some will steal before they head east." A cruising boat was intercepted last year while returning to Europe loaded with outboard engines stolen from the Caribbean. Our custom made bamboo dinghy outboard handle that was stolen last year.....a cruiser most certainly took that. Just a month ago, Turbulence Sails in Grenada posted video pictures of a cruiser who broke into their shop overnight and spent 3 hours trying to put together a roller furler to steal! He was not able to do it in the time before dawn and left. He was not caught and is still out here among us. Friends told us just this week of other cruising friends that were rafted up along side a French cruising boat in Europe. Both boats had their fenders tied in between. When the French boat left, the people discovered that their nice fenders that been taken and the old, worn out ones from the French boat were left behind. The French boat had simply retied the lines of the fenders switching them! I had an in depth discussion via email with the head of the Caribbean Safety and Security Net. This group keeps track of incidents of crime involving cruisers. It is invaluable information that keeps us all informed and let's us make wise decisions about our safety and where we chose to go. * If you are a cruiser and you are not using this - start NOW, today!! To date, this site has been reporting on thefts and crimes that happen TO cruisers. I suggested to CSSN that this recent iPad theft should be reported as well. It was a crime involving a cruiser. It just happened to be a crime BY a cruiser. In the end, it was decided that it did not fit the criteria for reporting as they do not report on crimes that happen ashore, only on yachts or dinghy docks. Interesting to think about however. As for the woman and her husband. They waited a day or so and then sailed out of the anchorage. Supposedly south, which is still part of St Vincent and the Grenadines. You can be sure that all the locals down there knew about the theft. Everyone is related. It made the Bequia TV news and beyond. The cruising community is a small and connected community as well. Word spread fast. Shock, disappointment, anger and disgust was the general feelings. I have mentioned before how fast and hard we make friends in the cruising lifestyle. We come together in unusual type settings. We help each other out to extraordinary ends at times and then we sail apart. There is an inherent trust built into this lifestyle. But how well do we really know our cruising friends and fellow cruisers? This event had much of the cruising community questioning these things. Personally, in regard to what we know about our fellow cruisers - we know very few last names, or what they did for a living, or where specifically in England, Germany, Wales, New York, Michigan, etc. they are from. But after much rehashing and discussion, ultimately Tom summed it up best. "Knowing what I know now, that she did it, would I do it all again? Would I put myself at risk and go to the extent I did? Yes." That is a bummer...because it makes you second guess your trust in people you meet. But I think Tom is right, you have to continue to trust people and do your best and what you think is right.